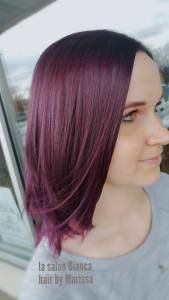 Check out our master stylist Marissa’s most recent blog on her clients hair! Purple purple purple!! Marissa’s guestt wanted something fun, but still work appropriate being a teacher. This purple, maroon color goes perfect with her green eyes and brings out her flawless skin tone.